I’d been given the heads-up about Pearly’s Farmhouse Café by a West Cornwall insider. “Check it out,” she said, “Everyone is going. The food is great and there’s a real sense of community. Oh,” she added, “and the owner’s story is really interesting.” Great food, community-oriented, and an interesting story? That’s a home run in this writer’s book. On a seasonable, partly sunny Wednesday afternoon in February, I had an appointment to talk to Sean Aylmer, the owner of Pearly’s, at around 3pm, when the restaurant would be closing for the day. True confession: I’d never been to West Cornwall – and even on a late winter day accentuated in gray and brown, I could see the appeal of the area. There’s a distinctly New England feel to this corner of Connecticut, there’s a bit of a wild vibe, too. One minute the road opens up before you with pastures stretching to the horizon, and the next you’re navigating a winding road flanked by woods. And then, there it is – the landmark covered bridge that brings you into West Cornwall. Constructed in 1864, the bridge, painted a bright barn red and only 172 feet long, is like a front door of sorts, welcoming you to town. Welcome to Cornwall, Pearly’s will welcome you! And just to the right, after getting through the bridge, is Pearly’s Farmhouse Café. There’s nothing fancy about the outside of the place, but you can’t miss its big sign with the name in friendly script as if to say, ‘Come on in!’ So I parked, and I did. Go in. Inside, the space is airy and elegant. There’s lots of light to welcome you. The walls are a calming shade of pale gray, and the floors and tables are a rich, dark, warm wood. There are booths and square tables and a round table – choices to make anyone (and everyone) comfortable. A self-serve coffee area greets you by the entryway, and you can get a fresh cup to stay or to go. I arrived after 2pm so I could have something to eat before talking to Sean, and I thought by that time there wouldn’t be many people in the restaurant, but there were. The café was nearly full, and the diners were diverse and included families, seniors, guys in jeans, and women in business attire. A big smile and a menu accompanied me to a table by the window with a view of a small patio, where I could imagine diners soaking up the summer sun in a few months. I turned my attention to the menu. I was hungry and everything looked good. Really good. Pearly’s Farmhouse Café lunch menu has classic comfort food selections – burgers, paninis, wraps, and even pizzas – featuring the usual mouth-watering ingredients, like bacon, cheese, roast beef, avocados, mushrooms – you get the idea. And while any of these would please me (and anyone I would typically have with me on such an outing), I was looking for something a bit more distinctive. And I found it. A Maple Sausage Ricotta Pizza, with Italian sausage, caramelized onions, maple-infused ricotta, and a provolone mozzarella cheese blend, drizzled with real maple syrup. It came to the table soon after I’d ordered. The crust was thin and speckled with corn meal, crispy dark in some places, golden brown in others, loaded with sausage and cheese and caramelized onions. It was delicious, with lots of salt and spice from the sausage, gooey goodness from the cheese, and a slight sweetness from the onions and a hint of syrup. Still delighting in a bite, chef Sean came out to tell me he had a burger on the grill and would need a few more minutes before we could talk. I had noticed that while I was indulging in my pizza the restaurant had as many people coming in as going out – even though it was nearly 3pm. I jumped on the opportunity to order dessert, too, and was just scraping the last traces of fudge sauce from the plate upon which my chocolate lava cake was served when Sean reappeared. Perfect timing. Sean and Justina were able to get started with renovations and adjustments to the space in September, opening as Pearly’s Farmhouse Café a mere month later, in October. That gives you an idea of what Sean can accomplish when his heart is in it. He explained that another big part of who he is is a Marine, and, as such, he understands discipline and goals. “All in; boots on the ground” is how he described it to me. “You learn discipline in the Marine Corp,” he says. He was in the Marines for four years, plus six years in the Reserves, with three years of active duty for a total of 13 years. “The Marine Corp gave me a set of rules to live by,” he explained. One day in the Marines, 23 years ago, I was decorating a cake for someone and I decorated it with the name Pearly’s on it.” He has a picture of that cake framed and hanging up in the restaurant. We talk about my maple sausage ricotta pizza, which I rave about. I ask him about his favorites, or signature dishes. “The eggs benedict,” he says. When I look at the breakfast menu, I can see why. Pearly’s has six variations on the dish, from the classic (with Canadian bacon and Hollandaise sauce) to an Irish Farmer (with corned beef), a Goat Farmer (with baby spinach and goat cheese, see picture to the left), and even a Lobster Benedict (with sherry-infused Hollandaise). “Also,” Sean notes, “my Western Omelet has marinated flank steak in it. I mean, when the settlers established themselves out West they had cattle, not pigs. Why is there ham in a Western Omelet?” Good point! 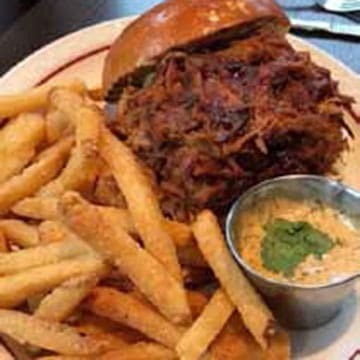 His pulled pork sells out instantly whenever he makes it, so it’ll soon become a fixture on the menu. And there’s the Green Monster burger, another Pearly’s classic, generously topped with avocado and jalapeño (as well as bacon, lettuce, tomato, and roasted garlic aioli). I should have ordered that, I think to myself. Or come for breakfast. Yes, all these delicious options give me many reasons to come back. It’s obvious from the steady stream of people on even that late Wednesday afternoon that folks around here are coming back. Sean is in the kitchen every day they’re open, from early in the morning until they close. Pearly’s was part of a segment on CT Perspective TV about different cuisines in the state. It aired on March 11. And Sean and Justina are as busy outside the restaurant as in it. They’re new to the area, so that’s been an adjustment. And they welcomed their second daughter together on January 7, Sean’s third girl. “I have a one-month-old, a 20-month-old, and a 13-year-old,” he beams. Like West Cornwall itself, at Pearly’s there’s a sense of timeless commitment to quality, a calm sophistication, and a hint of something wild being tamed. Eat well, live well, indeed. Make reservations on the weekend. And don’t forget to take a picture next to the bridge. Pearly’s Farmhouse Café located at 421 Sharon-Goshen Turnpike, West Cornwall, CT. Visit online at pearlysfarmhousecafe.com. Call (860) 248-3252. Open every day but Monday at 7am. Closing time varies by the day. Visit the website or Facebook page for more information.